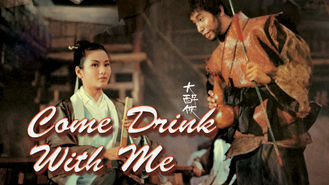 Come Drink with Me (1966) on Netflix USA. Check worldwide Netflix availability! When bandits kidnap his son, the governor sends his daughter Golden Swallow to the rescue. With the help of a local beggar known as Drunken Cat, Golden Swallow tracks down the main perpetrator, the evil monk Jade Faced Tiger.